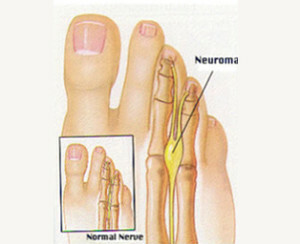 A neuroma is a benign enlargement and inflammation of a nerve. 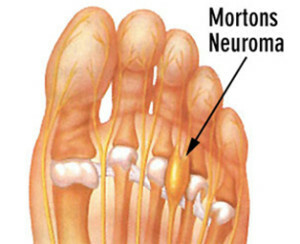 A Morton’s neuroma causes pain in the ball of the foot that shoots out to the third and fourth toes. The second and third toes can also be affected. The thickening, or enlargement, of the nerve that defines a neuroma is the result of compression and irritation of the nerve. This compression creates swelling of the nerve, and eventually can lead to permanent nerve damage. The Intermetatarsal plantar nerves pass between the spaces of the metatarsals. At the base of the toes, the nerves split forming a “Y” and enter the toes. In this area where the nerve is about to divide, a ligament crosses between and attaches to the metatarsal heads and perpendicular to the nerve. This ligament is called the deep transverse intermetatarsal ligament. It is in this area the nerve gets pinched and swells. Biomechanics: A neuroma develops from abnormal foot structure and mechanics, both of which are inherited features. 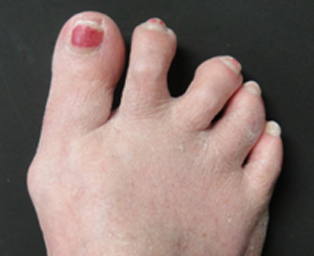 Some inherited foot defects such as a flat foot or a high-arched foot, can lead to the formation of a neuroma. These foot types bring on instability around the toe joints, leading to the development of the condition. Footwear: Certain types of footwear such as high heeled or tight, pointed-toe, or ill-fitting shoes can contribute to the development of neuromas. Footwear that causes the toes to be squeezed together or high heeled shoes can increase pressure on the forefoot area and contribute to neuroma formation. Improper footwear can exacerbate the problem caused by the original genetic structure. Neuromas are more commonly found in women. Injury: Injuries to the foot can also be a factor in developing a neuroma. Trauma can cause damage to the nerve, resulting in inflammation or swelling of the nerve. Repeated stress, common to many occupations and recreational activities, can create or aggravate a neuroma. Affected individuals may have a feeling as if they are standing on a pebble in their shoe or feel like their sock is wadded up. A burning pain in the ball of your foot is also common, which may radiate into the toes along with numbness. The pain is usually aggravated by walking and relieved by rest. Swelling between the toes may be present as well as pain in the ball of the foot with weight bearing. 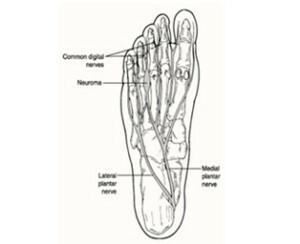 Physical exam: Clinical examination of the foot is the most important way to evaluate for a neuroma. Palpation of the foot between and just behind the metatarsal heads will elicit pain and often electric shooting into the toes. 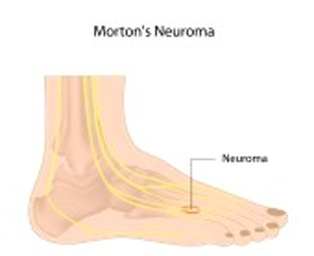 Squeezing the foot together and pushing up under the nerve will, in many cases, yield a positive “Mulder’s Click.” This clicking sound associated with pain shooting to the toes is diagnostic for a Morton’s neuroma. X-rays: X-rays are necessary to evaluate if there is any bone involvement that may contribute to the damage to the nerve. Magnetic Resonance Imaging (MRI) may be best considered in patients with recurrent neuromas, atypical symptoms, difficult cases or when the neuroma is suspected in an adjacent inter-metatarsal space. Ultrasound testing can be also used to confirm the diagnosis if necessary. The conservative method of treating neuromas begins with accommodating the deformity. The goal is to reduce pressure in the painful area. Padding and Taping: Over-the-counter shoe pads can relieve pressure around the affected area. These small pads, adhesive pads, are designed to sit under the middle of the foot and take pressure off the nerve. The placement of these pads is very important. The pad should not sit right under the ball of the foot which would increase the pressure right at the nerve and increase pain. The pad should sit right behind the ball of the foot. When stepping down on the neuroma pad, it should feel like it’s more toward the middle of the foot. It should not cause discomfort. Medication: Anti-inflammatory drugs may be used to ease acute pain and inflammation caused by the neuroma. Injections: A steroid injection will help to decrease the inflammation in the area. However, the number of injections a patient can receive is limited due to possible side effects. Another option, which is somewhat controversial, is alcohol injections (also called nerve sclerosing). The typical course of therapy includes weekly injections for 4-7 weeks. Ice: Ice the ball of the foot for 15 minutes twice a day, and more if time allows. Orthotic Devices: Custom functional orthotics prescribed by your foot and ankle physician may be useful in controlling foot function. An orthotic device may reduce symptoms and prevent the worsening of the condition. Shoes: Wear shoes with plenty of room for the toes to move, low heels, and laces or buckles that allow for width adjustment. Wear shoes with thick, shock-absorbent soles and proper insoles that are designed to keep excessive pressure off of the foot. High heels should be avoided because they place undue strain on the forefoot and can contribute to a number of foot deformities. Activity: Decrease your activity when possible and limit going up and down stairs, squatting and any other activity that puts stress on the ball of the foot. Conservative treatments for neuromas are often limited because they cannot correct any bone or soft tissues deformities that contribute to the formation of the neuroma. If conservative treatment fails or the neuroma progresses to the point where conservative treatment is no longer a viable option, surgical intervention may be needed to correct the deformity. Both the traditional and minimally invasive neuroma surgical correction techniques are performed at the Coeur d’Alene Foot and Ankle Surgery Center. Many different surgical techniques are available to remove or reduce a neuroma. Open or traditional surgical correction techniques involve skin incisions on average 3 -4 cm to perform the cutting and the removal of the nerve. An area of permanent numbness will remain on the foot since the nerve is removed. The incision is performed usually in the dorsal aspect of the foot in between the affected intermetatarsal area. Incisions used in minimally invasive or minimal incision percutaneous surgery are much smaller, typically 2-3 mm. For this technique, surgeons use instruments which are very fine to perform the surgery through the small incision. The surgical instruments are carefully maneuvered through all of the structures of the foot to release the deep transverse intermetatarsal ligament via a minimally invasive nerve decompression, which will reduce the compression of the nerve. A surgical metatarsal bone cut may also be needed if it is determined that metatarsal pressure is a contributing cause to the formation of the neuroma. A minimally invasive nerve decompression technique can reduce the length of the scar, and eliminate permanent numbness as the nerve is not removed, as well as obtaining the best cosmetic result. Surgery is performed under Fluoroscopic viewing enabling the physician to view the anatomy despite the small incisions. There is generally less trauma to the tissue and surgical times are lessened with this technique, reducing pain and recovery time. Often, sutures are not necessary and the patient is able to walk immediately. A surgical shoe or boot is provided for stability. The most commonly performed MIS procedure for Morton’s neuroma correction at the Coeur d’Alene Foot & Ankle Surgery Center is the Isham correction procedure (release of the deep transverse intermetatarsal ligament along with special surgical metatarsal bone cuts, to free the entrapped nerve and correct the deformed metatarsal bones). On rare occasions, if there is a growth pressing the nerve then the surgeon may need to use a larger incision to remove this growth. Surgeries are performed at the CDA Foot and Ankle Surgery Center and are done with local anesthesia where in the foot usually stays asleep 4 to 6 hours. A small surgical incision is used which enables the surgeon to use fine specially designed instruments to obtain the best long term pain free, functional and cosmetic results. Often times no sutures are required due to the small incision size. Dr. Nunez also uses a fluoroscope during surgery, enabling him to visualize foot anatomy during surgery in spite of the small incisions. The entire surgery takes approximately 1- 2 hours. This includes viewing a preoperative video and procedure explanation, anesthetic administration, setting up the sterile field, the surgical procedure and post operative dressing and instructions.